Fry paneer in oil till it gets slight brown on the sides & keep it aside. Add onion fry till light brown. Add tomato stir till cooked. Add capsicum stir for 2min. Stir till garlic raw smell reduces. Add water, salt, and sugar. 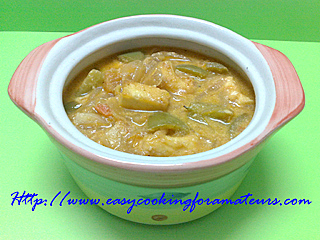 Add paneer & cook it for 2min. Add milk & immediately switch off the gas. Note: Don’t boil after adding milk. Serve it hot with Indian breads. Your dishes look amazing.I came across your site from the Foodieblogroll and if you won't mind, I'd love to guide foodista readers to your site.Just add your choice of Foodista widget at the end of this blog post and you're all set. Thanks! Thanks all, for your feedback & kind words. Your suggestion will be appreciated & considered.